Ralph Gardner – Ralph Gardner Jr.
And why are they crossing the road, you might ask yourself? And if you don’t you should because there are few things that rouse our spirits and redeem our natures as much as allowing ourselves, no matter the challenges of life, to remain susceptible to the marvels of the natural world. They’re crossing the road to reach vernal pools to breed. Or perhaps returning from them since some frogs already appear extremely pregnant. It’s actually a full-blown migration, though the critters rarely travel more than a few hundred feet; then again if you’re a northern spring peeper approximately one inch long and most at home in trees and underbrush dodging traffic on blacktop, a few hundred feet can feel very far and exhausting indeed. And what are vernal pools, you might ask? As I did when I joined Arianna Ferrario of the Columbia Land Conservancy on a recent evening in the hope of finding peepers, wood frogs and salamanders and saving them from the vicissitudes of steel-belted radial tires. So vernal pools are small, temporary, woodland bodies of water. And they constitute essential breeding grounds for amphibians because they don’t have to worry about being gobbled up by fish that, for obvious reasons, avoid bodies of water that all but dry up during the summer months. Ms. Ferrario, a Conservation Easement Stewardship Assistant with the Conservancy, cautioned me that the conditions weren’t ideal when we ventured out just after nightfall because it wasn’t raining. Perhaps unsurprisingly, amphibians, who have an especially life-affirming relationship with H2O, prefer rainy nights to facilitate their odysseys. However, the temperature was right: at or above forty degrees after sunset and it was moist, having rained earlier in the day. Ms. Ferrario had also suggested I come equipped wearing a headlamp and a reflective vest, so I wouldn’t get pancaked by a pickup truck; to wit, become a statistic of just the sort we were hoping to help our toad friends avoid. I did her one better, arriving with a spotlight that cast a powerful beam up and down our mostly deserted country road. I recommend such a device to everyone. If you’re the type who fears there are creatures lurking in your woods, you’ll find your paranoia ameliorated when armed with a trusty rechargeable lamp approximately the intensity of those searchlights employed during the Battle of Britain. Shining the spotlight also served to warn the few cars that passed us during our hour rescuing frogs and salamanders to slow down. If any of them thought it unusual to happen upon pedestrians wearing headlamps, carrying clipboards and shooing frogs along a country road they didn’t let it show. But if they had stopped what we’d have told them was that amphibians are declining around the world. The greatest threats to our local populations include habitat loss, pesticides, disease and, of course, roadkill. The New York State Department of Environmental Conservation and Cornell University, in conjunction with conservation groups such as the Columbia Land Conservancy, has created a program where volunteers go out to amphibian migration road crossing in early spring both to catalogue the tiny, slimy beasts and move them out of harms way. On the DEC website you can even download official Amphibian Migrations and Road Crossings Data Collection forms to enter information such as the current and past precipitation conditions, traffic volume, and, of course, the kind and quantity of salamanders, frogs and toads you encountered. It wasn’t long before Ms. Ferrario and I spotted our first candidate, a peeper sitting in the approximate geographic center of the road. Ms. Ferrario, who grew up in Brooklyn and moved to New Hampshire where she earned a masters degree in environmental studies and conservation biology before migrating herself, to the Hudson Valley in November, did her best to determine which direction the pepper was heading and send him on his way. Obviously, it would have been counterproductive to return him from whence he came, and probably also highly frustrating for the frog who’d just have to retrace his or her steps. However, sometimes it wasn’t easy to tell. Nonetheless, we rescued ten wood frogs and thirteen spring peepers. It wasn’t until we were heading back to my house that we spotted our first salamander. He, or perhaps she, was a handsome dark grey specimen with bright yellow spots. And not small, either. Six inches or longer. Ms. Ferrario took its photograph, explaining that you can identify individual salamanders by their spot patterns. We found two more of them before the evening was done. However, no Jefferson or marbled salamanders, or for that matter, the garish reddish-orange eastern newt. And while you may want to shield the tender ears of children, we also encountered four deceased wood frogs and two peepers, the animals probably having perished just in the amount of time we walked a half mile or so down the road and back again, undoubtedly to motorists, even though no more than three or four cars passed during our outing. As I was saying, if you’d like to join the project you can find more information, as well as a volunteer handbook and forms on the DEC website. You might even get to hold a salamander in your hand. They’re cute and slippery with dexterous little feet. I’d recommend the experience to anybody. It’s supposed to be a representation of rugged individualism and the ability to think for oneself rather than going with the crowd — again when it comes to choosing your next vehicle, smoke, or over the counter regularity cure. There’s something affecting learning about the lives of the beloved but sometimes unheralded – the schools they attended, the jobs they held, those they cared for and cared for them, their favorite sports or hobbies. Those in the Times – the paid, not the news obituaries – tend to be a self-selecting crowd if only because a paid obit in the “Newspaper of Record” costs a couple of thousand bucks for a bare minimum of words. It’s rare that I come across an upstate obituary of someone I actually knew since I’m a part-time resident. But I did a few weeks ago, of a gentleman I haven’t seen or spoken to in years but who I nonetheless considered a friend. As I suspect many did. His name was George Palmatier and he was once the manager at the Grand Union supermarket in Valatie, NY. George was into customer service well before it became corporate America’s mantra. He worked harder stocking the supermarket’s shelves than any of his employees yet he always had time for conversation. He was perennially cheerful without being over the top. And it goes without saying that if there was something you couldn’t find George would find it for you. And if he couldn’t he’d endeavor to get it before your next visit. George Palmatier was the personification of community. And his public service – I consider running a clean, efficient, well-stocked supermarket a form of community service – didn’t end when he left work for the day. As his obituary noted he also led weekly Bible study classes at the Hudson Correctional Facility and he volunteered at the Ghent Food Pantry. Born in 1947, the obit also revealed that George had been employed by the Grand Union Company for 41 years. It was a sad day when the Valatie Grand Union went out of business – the handwriting was on the wall as soon as a much larger Hannaford’s opened down the road – and George was reassigned to a distant Grand Union; at least too far for me to travel to conveniently. I should probably also mention that I may have stronger feelings about supermarkets and the Feng Shui of supermarkets than most. It probably has something to do with having grown up in New York City where, because of the limitations of space and the price of real estate, supermarkets – at least in the days before Fairway, Whole Foods and Trader Joe’s – were supermarkets in name only. The aisles are so narrow it’s difficult for two shoppers to navigate them simultaneously, even without carts. But I remember the feeling of visiting my grandparents upstate and shopping with them at Hudson’s comparatively oceanic supermarkets. The sheer variety of things like breakfast cereals and sodas, cakes and candies, let alone the width of the aisles, was awe-inspiring. Deep into middle age I haven’t forsaken much of that childlike sense of consumer wonder. I still experience something resembling well-being upon arrival at a well laid out supermarket. My wife, perhaps because she grew up in the suburbs of Long Island, often prefers to wait in the car while I shop. I suppose it also has something to do with the length of time I linger over the merchandise, unit pricing one item against another. But that’s for a different day and a different commentary. However, I have to believe that a failure to experience joy in the supermarket shopping experience is evidence of a character flaw of some sort. I’m not going to play favorite among our local supermarkets, though I have my preferences and opinions. Yet as bounteous and generally eager to please as they are the old Valatie Grand Union remains my favorite. Obviously George and his welcoming smile was a big part of it, but not the entire reason. I also consider daylight important and the Grand Union had a wall of windows facing east, if memory serves me correctly. I can’t quite articulate why this should be important to me. You’re not going there for the view, obviously. But it’s possible to experience frustration claustrophobia and stress in a food store the size of an airplane hanger if it’s not orchestrated thoughtfully, if not necessarily lyrically. It reminds me of casinos where the windows are tinted grey to dupe your senses into believing that it’s dreary outdoors and better to stay inside and keep gambling. Speaking, if only for myself, a well and somewhat naturally lighted supermarket encourages you to shop; it adds an element of nature to what otherwise might seem a highly artificial environment. Which may be why people like supermarket managers and cheerful checkout clerks you come to recognize play an out-sized role. They humanize the experience. Yet none I’ve encountered has ever surpassed George Palmatier. If one’s ministry can be said also to treat everyone you encounter with dignity, respect and an unforced smile, George practiced it every day. What I’m talking about is the circumstances and the affection surrounding her passing among her children, grandchildren and caregivers in the final days of her life. People say you can’t imagine what the death of a parent feels like, especially your mother’s, until it happens to you. I suppose that’s true. You’ve known her longer than you’ve known anybody else; you’ve never known a world without her. And now that she’s gone all sorts of metaphors compete to describe her absence, none of them quite sufficient, precise or profound enough. It’s the physical sensation that she’s gone, the realization that a protective membrane that stood between you and the world has dissolved, even if you long ago learned how to fend for yourself. Fortunately, there are many things to take solace in – her memory, for starters. My mother, who was born in Europe and moved to the United States just before World War II, left behind quite a legacy. She could be maddening, stubborn and autocratic. But also absurdly generous and loving; her eccentricities were too many and varied to enumerate here. But some of them were also so lovely and vivid – for example throwing a birthday party for her Boston Terrier in Italy every summer – that her grandchildren, who sat by her bedside in her final days, will be able to share her legend with their own children and grandchildren. Her decline started several years ago when her sister and a cousin who called from Paris every day, often several times a day, passed away. It was disorienting for her, even if my mother denied it. She told me she didn’t feel sad because she refused to believe it. That decision may start to provide a sense of the way she was able to inhabit a world of her own creation, as few could. People felt sorry for her because she was bedridden. I was required to explain that my mother preferred bed, or prior to that her chaise longue, to any sort of exercise for most of her life. She often told me she’d never been happier than in the last few years – kept company by her cat Cookie and Skippy, Boston Terrier #5 – and her devoted caregivers. Since she couldn’t get out of bed she no longer felt any social pressure to do so. I’m not going to make light of the last days of her life. She went to the hospital with pneumonia and soon lapsed into semi-consciousness, if she was conscious at all. But she died much the way she lived. When my daughters would visit her at home, they’d make themselves a drink, then join her in her bedroom where she’d interrogate them about their love lives. There was no communications gap to bridge between her and her grandchildren. She often said she felt sixteen. And in her mind, if not her body, she still was. She was above all a great romantic. My younger daughter Gracie got one of the last reactions out her a few weeks ago when Gracie told my mother, who often consulted astrologers and fortune tellers when she was younger, that she’d visited a astrologer herself. The astrologer told Gracie that she’d meet her husband this year. “Go on!” my mother exclaimed, surfacing from the haze that surrounded her final months. As we kept vigil by her bedside at Lenox Hill Hospital in New York City, we were joined by nurses and doctors who came and went monitoring her condition and offering words of comfort, even though there wasn’t much they could do for her at that point except to make sure she suffered as little as possible. The American health care system probably deserves the criticism it receives. But my mother’s care couldn’t have been more diligent or compassionate. When the hospital realized she was too weak to go home, and even moving her to hospice was no longer possible, they provided her a private room so that we could all be together – my brothers, our wives and our children – even rolling in a tray of snacks and soft drinks. As at least one of her grandchildren wryly noted that the setting wasn’t all that dissimilar from the one at home – my mother in bed surrounded by refreshments, conversation and love. The only thing missing were her pets. Her funeral was as gentle and lovely as her life, framed by bouquets of yellow roses. I mentioned her eccentricities. One of them was the color yellow. There’s nothing wrong with yellow. It’s a fine color. But my mother went overboard, painting entire rooms – not just the walls, but also the furniture and floors yellow. She said it was cheerful. I gave one of the eulogies, my older daughter Lucy another, and Lucy’s cousin Emma a third. There was no dearth of anecdotes to draw from. My mother was married to amazement almost to the very end. How many of us can say that? A former C.I.A. lawyer – that would be the Central Intelligence Agency not the Culinary Institute of America – she and her husband Bob, also an attorney and an expert on money laundering who held senior positions at the Treasury Department and in the private sector, dreamed of lives that revolved around community, nature and animals. Only they didn’t open an inn or a bookstore. They started an alpaca farm. Oh yeah, and then they bought an existing alpaca products store on Warren Street in Hudson, NY, Spruce Ridge Alpaca, renaming it Fluff. This is where I come in. I like to think of myself as something of a connoisseur of socks. And in my humble yet considered opinion, alpaca socks are some of the coziest, most comfortable I’ve ever had the pleasure to have worn. Just as caressing as cashmere but far more durable. Suzanne concurred when I visited her on a recent sunny Saturday morning at Green River Hollow Farm in Hillsdale, NY. She shares the place with her husband, of course, but also with thirteen alpaca, a llama, a donkey, two Icelandic horses, and numerous chickens. Before braving the outdoors to visit the animals I wanted to discuss her socks. Not hers but Fluff’s. She said she has customers who come in and buy $500 worth of socks. She stocked up last October – the socks are made in Peru – but had pretty much run out by the holiday season and had to reorder. “I’m ordering all the colors in everything,” she promised. I’d wanted to get together with her for a couple of reasons. I have a passing interest in alpacas – they seem somewhat otherworldly creatures; but I also wanted to lobby Suzanne to expand her sock color palate, if possible. As soft and lovely as they are, in extra large they’re pretty much limited to the predictable colors – black, grey, red. Though the red is pretty cool. But as Suzanne acknowledged unprompted conservative clothes sorts such as myself, sartorial stick-in-the-muds as it were, unleash their inner freak through their socks – purples, cerulean blues, pinks, yellows and stripes in various and sometimes counterintuitive combinations. I politely disagreed. I’d visited Fluff and lamented that while I’d spotted purple socks in ladies sizes there were none that catered to the oafish size 12 male foot. But she was essentially correct as I confirmed last week when I combined a visit to Fluff with a tasty Neapolitan mozzarella di bufala pizza lunch a few doors down Warren Street at Oak Pizzeria. While Fluff didn’t carry the purple dress sock they did in the thicker “sport” model. I’m skeptical of thick socks; they make your feet sweat. But these garments were cloudlike; they felt like walking on air. I’m not too proud to quote better, more poetic writers than myself, of which there are sadly legion. And I don’t think I can put alpaca’s magical properties any better than the label on the socks. 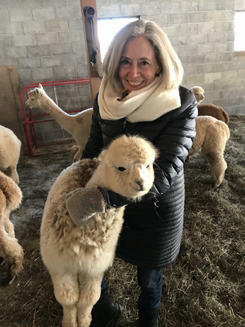 Which brings us to Green River Hollow Farm’s alpacas and how they fare in the Hudson Valley’s perhaps somewhat less temperate climate. Indeed, her learning curve has included repairing electric water heaters. We visited the barn and the doe-eyed South American camelids. They look so cuddly, like the life-size Steiff animals they used to sell at FAO Schwarz, that you want to hug them. Among several rules I religiously adhere to regarding other living creatures is honoring the wishes of those who prefer not to be hugged. So I didn’t. Under the protective eye of their donkey, Lulu, who polices the perimeter of the property while their llama, Trixie, guards the alpacas. For example, “Shouganai” in Japanese, apologies for my pronunciation to any Japanese speakers. It roughly means something that can’t be helped so why worry about it. Or “Komorebi,” another Japanese word. This one means the interplay of light and leaves when sunlight shines through trees. Or “Mangata,” the Swedish word for the shimmering reflection of the moon on water. Another experience for which I’ve yet to stumble across a one-word description in English or any other language, though that doesn’t mean it isn’t out there, is the subliminal presence of pets. Last week I happened to be in city alone, without my wife or our dog Wallie. I don’t mean to suggest I missed Wallie more. But her absence is felt more viscerally. Part of the explanation probably has something to do with the predictability of pets, the familiarity of their cadences. For example, the fuss they make when you walk through the front door. That doesn’t mean my wife is unhappy to see me. However, I haven’t known her to drop whatever she’s doing to rush over and greet me. But it’s not just the welcoming experience. There’s a certain profundity about the presence of a pet even when they’re not doing anything. Sleeping, for instance. It’s the companionship, the reassurance of another breathing soul in one’s life. Maybe it has something to do with the essence of the relationship between a human and an animal since it’s largely non-verbal. It’s as much felt in silence as in sound. It’s the realization that they’re going about their own lives as you go about yours in a shared space. I suppose that applies equally to a human roommate. Perhaps the difference is that a pet is dependent on you in a way that a person, who can fend for himself or herself more or less, isn’t. You know you’re responsible for their wellbeing so that even when you’re not engaged with them they’re subconsciously on your mind. Yet that dependency, though to describe it as such denigrates the mutuality of the experience, that connection, goes both ways. Wallie is never freer or seemingly more ebullient than when we’re taking walks in the woods. To travel the woods without her is a less joyous experience. Perhaps because she’s a hound, a so-called working dog, who feels she’s finally getting to exercise not just her body but also her destiny when she’s out there tracking down animal scents. Her canter is a joy to behold. She can also accelerate approximately as fast as a deer and frequently does. It would be fun to pin a pedometer to her because I suspect that on our average hour-long walk she travels fifty times my distance coming and going, coming and going. Her breed and breeding also likely has something to do with the peculiar mark she leaves on our lives. 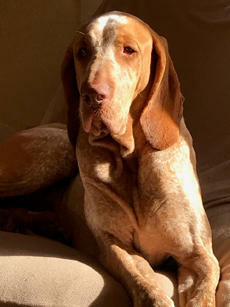 She’s a Bracco Italiano, a gun dog, with the long floppy ears and folds of flesh reminiscent of a blood hound, but more delicate. She’s described on the American Kennel Club website as one of the oldest pointing breeds, developed in Northern Italy. Her mission in life is to identify prey and then retrieve it. I don’t know how many other breeds do this: when you return home she greets you not just with a wagging tail but also with a gift in her mouth. A toy, a bone, a stolen sock. Accompanied by a low guttural sound that could be mistaken for a growl if you didn’t know her better. She’s seeking acknowledgement for her offering. Perhaps because she’s a frustrated hunter. I might have attributed Wallie’s peculiar behavior to her and her alone until we visited another Bracco and saw that dog behaved in precisely the same way. But whatever the nature of that companionship Wallie provides, it’s felt as profoundly in the woods as in our apartment in the city or house upstate. As I said, a walk through the forest is lonelier without her, even though she’s absent much of the time, off doing her own thing – sniffing, running, barking if she thinks she’s cornered a chipmunk in a hollowed out tree or the crevice of a stone fence, and most aromatically of all, shoulder diving into a pile of deer droppings. I carry a leash to corral her when we’re crossing into the woods from one side of the town road to the other. But you can tell it’s a crushing blow to her ego. The compensation comes when you successfully navigate that passage, release her, and watch her bounding off into the woods again. The word for that is freedom. There was little of the original candy store left – just a couple of copper kettles and a few chocolate molds. He’s also recreated Vasilow’s inlaid tile floor. Most significantly, with his grandfather gone Jim had no guide or mentor to teach him how to master the art of making chocolates and candies. So he set out to learn, crisscrossing the country taking classes. The couple opened the reincarnated Vasilow’s in 2002. I don’t see why one has to choose. While I also prefer a dark chocolate cream — the bitterness of the chocolate setting off the sweetness of the raspberry, orange or maple filling — a milk chocolate cherry cordial overloads the brain as few activities that come without emotional complications can. Christmas is the busiest season, with Valentine’s Day and Easter – Vasilow’s has a collection of bunny molds in various shapes and sizes as well as solid and hollow – coming in a close second. No, the complication I’m speaking of is going on Facebook or Instagram and having to suffer photographs and commentary from your friends and acquaintances of them lolling on the beach in Belize or floating on their backs in Cozumel. Perhaps the problem is that I’m a bad person. I should be happy for my friends that they’re enjoying themselves and getting a tan while I fret that, after the snow ceases and the wind begins to howl, the electricity is going to go out and the pipes freeze because yet another season has passed that I’ve failed to invest in a generator. I’m confident that the only reason they’re posting images of azure seas and golden sunsets, sometimes filtered through the prism of a pina colada garnished with a cocktail umbrella, is because they want to share their happiness and because they know their friends will be just as joyous and fulfilled living vicariously through their adventures as if we’d boarded a plane ourselves and were buffeted by the welcoming breezes of the Bahamas. Did I mention that I’m not such a person? I’m the envious sort. Don’t get me wrong. I’m happy for you that you afford a bike trip through Thailand and sticky rice with the locals. But I would prefer it were me. Does this make me petty? Perhaps it does. However, in my own defense when I travel I try to keep it to myself. Of course, I have no control over what other family members post. But my particular conceit is that people who didn’t get their first passport stamped and boarded their first airplane yesterday don’t need to brag about it. Actually what you just heard is a long-winded introduction to testifying that while I’m no more immune than the next guy to feelings of superiority on the charmed occasions when I’ve been swimming with colorful parrotfishes in the Caribbean knowing it’s blizzarding back home, there are few things that fill me with the anticipation of knowing that I’m available for a good snowstorm; that one promising a foot or more of precipitation is on the way. As it was last weekend. If global warming has any positive consequences it’s this: after a non-eventful, almost non-winter weather-wise through Christmas and New Year’s, I was chaffing for a good old, honest-to-God Snowmageddon. Not one where the lights go out, of course, or a foot of ice sends tree limbs crashing through the roof but just about anything else. Think about it. If the allure of the tropics is measured in trappings such as palm trees and water the color of breath mints what we’re known for up north besides, of course, flinty self-reliance born of an often hostile climate, is the ineluctable beauty of falling snow and, once the sun returns, the way that source of warmth, light and life glints, jewel-like off freshly covered fields. And there’s skiing, obviously. If adrenalin happens to be your thing it’s far easier to access bombing down a mountain than it is lolling by a swimming pool at Atlantis. I’m not referring to their ten-story Mayan waterslide. But, again, speaking only for myself, my idea of exotic travel doesn’t include a waterpark, no matter how over-the-top or ubiquitously advertised. Indeed, I can’t think of anything more delightful than the anticipation I feel with a major snowstorm on the way. I know that not everybody shares my sense of childlike wonder. For many it’s a nuisance, especially if they have to commute. But part of its magic is that it serves as an enforced time-out from the pressures of the modern world. Being snowed in focuses one on life’s more subtle pleasures, things like a good book, a roaring fire and a late season football game if the electricity doesn’t die and I manage to survive accessing my roof and satellite dish to exfoliate it of the snow and inch-thick ice. Among the actions I undertook ahead of last week’s storm was frequently to check the weather starting several days out and purchase a snow shovel at Lowe’s with one of those bent, ergonomic handles. I also took a warm bath after checking the weather radar one more time and watching the blue mass on the screen, signifying the approach tempest, inch ever closer. There’s nothing that connects you to the cozier, more visceral memories of childhood than a bath as night falls and with it the first flakes heralding the oncoming storm.